The Illinois Senate passed a bill regulating use of drones as the relatively affordable surveillance technology becomes increasingly popular among local law enforcement agencies. The Illinois Senate last week approved a sweeping drone privacy bill championed by state Sen. Daniel Biss of Evanston. The bill sponsored by Biss, a Democrat, would prohibit police departments in the state from using drones for surveillance without first obtaining a warrant. The bill passed 52-1 and moves to the Illinois House of Representatives, where state Rep. Ann Williams (D-Belmont) has signed on as its chief sponsor. “We’ve passed a piece of legislation that effectively balances the right to be left alone with the legitimate contributions drones may make to public safety,” Biss said in a news release. Evanston Police could take advantage of the technology in the city by using drones to oversee public problems such as traffic accidents, Cmdr. Jay Parrott said. However, at this time, EPD is not actively considering buying a drone. “We are not looking into drones in the near future and would only consider looking at this type of equipment if feasible and cost effective once proper regulations are established and tested by other agencies,” Parrott said in an email. As overseas conflicts wind down, defense contractors and corporations are looking for ways to market their products domestically. 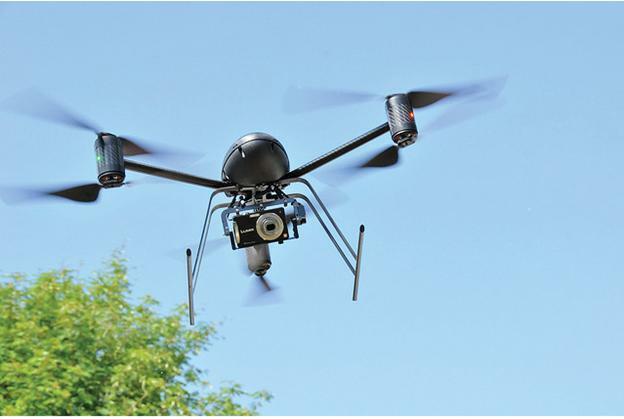 The use of drones, also called unmanned aerial vehicles, by law enforcement has attracted national attention. The diverse capabilities of drones make them useful in many law enforcement situations, ranging from taking aerial footage of crime scenes to using infrared cameras to conduct rescue operations. Drones are especially helpful in open, rural areas where they can cover wide patches of land. The Illinois National Guard has conducted drone training flights in Illinois airspace, and Cook County Sheriff Thomas Dart has considered using drones as a law enforcement tool, according to the Chicago Tribune. Some state representatives say Biss’ bill took a proactive approach as drones become a more popular law enforcement tool. State Rep. David Harris (R-Mount Prospect), a sponsor of the bill and former adjunct general of the Illinois National Guard, said the bill would protect citizens’ privacy rights as the technology spreads through law enforcement agencies. “More and more security departments, whether it’s various national guards, police forces or sheriff forces, are using drones,” Harris said. State Rep. Adam Brown (R-Champaign) agreed the proposal would protect the privacy rights of civilians. Brown co-sponsored the bill and has proposed his own bill to ban warrantless drone searches. The Champaign Police Department already has a drone, Brown said. The Chicago Police Department does not have plans to use drones, CPD spokesman Adam Collins said in an email. Ed Yohnka, spokesman for the American Civil Liberties Union of Illinois, said the organization lobbied state senators to support the bill and plans to continue efforts as the legislation progresses to the Illinois House. Amendments to the bill will likely be made in the House to give local police greater leeway in using drones in emergency situations, in light of national security concerns in the aftermath of the Boston Marathon bombings, Brown said. President Barack Obama signed a bill last year that opens American airspace to domestic drones by 2015.